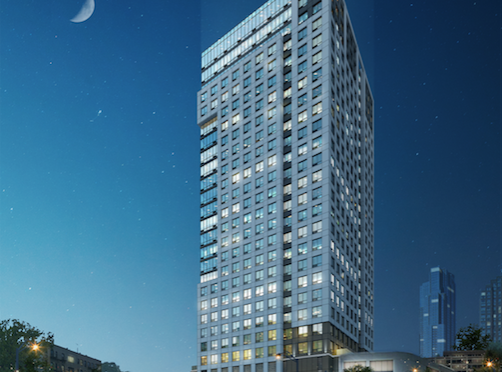 Proposed tower at 45 Harrison, viewed from Huguenot. New Rochelle has chosen MacQuesten Development to redevelop 45 Harrison Street, the present location of our downtown fire station. The selection follows the issuance of an RFP for the site in January and presentations from two capable development teams in May. 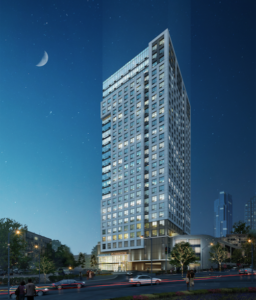 MacQuesten proposes to construct a 27-story residential tower with ground floor retail/restaurant space. Office space might also be included on lower levels. 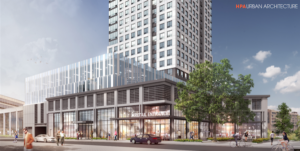 This project will make an impressive statement at the eastern gateway to our downtown, just as RXR’s first project at 587 Main Street marks the western gateway. In addition, MacQuesten will provide both financial resources and professional expertise to assist in the construction of a new, modern fire station. Retail frontage on Harrison Street. Since approving our ambitious downtown plan in December 2015, New Rochelle’s positive momentum has built by the week. This new announcement marks yet another important milestone on our way to creating a walkable, exciting, and attractive city center.